For those who are interested in Baptist history, this is a “must read” volume by Robert Oliver! 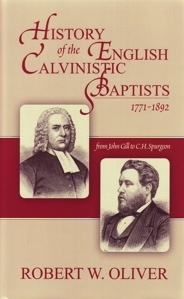 This book, History of the English Calvinistic Baptists, traces the story of the English Calvinistic Baptists from the death of John Gill in 1771 to that of Charles Haddon Spurgeon in 1892. It deals not only with the well-known digures in this community’s history–theological giants like John Gill, Andrew Fuller, Wiliam Gadsby, and Charles Spurgeon–but also with lesser-known lights, men like the hymn writer Benjamin Beddome, the eccentric John Collett Ryland, Abraham Booth, and John Stevens.